With new regulations in effect like HIPAA and GLB-Act, keeping company, employee and customer information private is mandatory. Our degaussers will help you meet these new physical safeguard regulations by completely demagnetizing all data from hard drives. 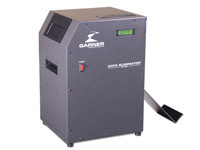 The HD-2 is the newest and most innovative product in the line of degaussers. The HD-2 erases hard drives (laptop, desktop and network up to 1.5" high) and high coercivity tape media, including all formats of LTO (1,2,3,4), SuperDLT I & II, DLT, AIT, 8mm and more, all without any adapters. Features include a continuous duty rating (no cooling necessary) quiet operation and a 60 second cycle time. The HD-3WXL is the newest and most innovative product in the line of degaussers. The HD-3WXL erases full height (1.66" in height), standard height and laptop hard drives and high coercivity tape media including all formats of LTO (1, 2, 3 and 4), SuperDLT I & II, DLT, 9940, 3592, AIT, 8mm and more, all without any adapters. With a continuous duty rating (no cooling necessary) and 10 second cycle time, even large quantities of media can be erased in a very short period of time. 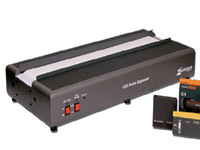 NSA approved degausser for Type I, II & III media including hard disks up to 5300 Oe. and tape media up to 2600 Oe. 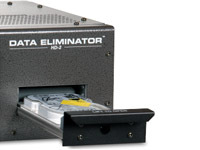 Permanently erases 2.5" & 3.5" hard drives up to 1" in height, and tape formats including SDLT, DLT, LTO/LTO2, DAT, TRAVAN, AIT, QIC, 8mm and more. The rare earth magnet design produces a 13,000 oersted field and can be used with or without electrical power. 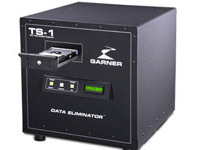 The TS-1 Data Eliminator, an NSA Evaluated Products List High Security Degausser, utilizes proven solid-state technology to provide a 20,000 gauss erasing field ensuring complete hard drive and tape erasure of classified and "Top Secret" data in 45 seconds. These machines physically destroy hard drives by bending, breaking and mangling the hard drive and its internal components including the data platters. The data platters are bent and separated from the hub, the hard drive housing is cracked, the PC board is broken and the read/write heads are mangled. They meet NIST, HIPAA, PCI-DSS and GLBA compliance and guidelines requiring destruction of data contained on hard drives. 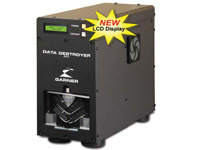 The PD-5 Data Destroyer is a brand new product for 2013. With 50% more crushing power than the PD-4, an LCD display, a 9 second cycle for two standard hard drives and an optional SSD/Flash Media destruction insert (SSD-1), the PD-5 is the most feature packed hard drive destroyer on the market. At 72 pounds, the PD-5�s all aluminum chassis, motor and main components make it the lightest hard drive destroyer available as well as completely recyclable. Ensure the safety of your information by controlling your media while it is going through the end of life-cycle process. Made specifically to incorporate the HD-3W Series Degaussers and the PD-4 Physical Destroyer in to a Degauss-Destroy-Recycle System. The DDR-1 System is designed to utilize a secure area to store media before degaussing and manage degaussed and destroyed media after processing using color coded bins and a special recycling container. With new regulations in effect like HIPAA and GLB-Act, keeping company, employee and customer information private is mandatory. Our tape degaussers will help you meet these new physical safeguard regulations by completely demagnetizing all data from tapes. 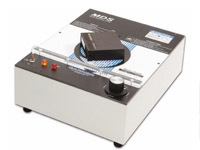 The CDS-2500A Professional Degausser is designed to erase all formats of media that are up to 6 inches in width. The degaussing field strength switch provides the option to change between high and low field strengths. It is like having two degaussers in one. 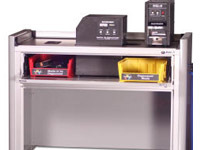 On low, the CDS-2500A is a continuous duty degausser capable of degaussing over 90 VHS tapes per minute without overheating. 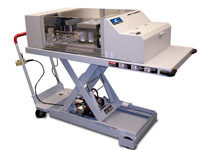 On high, the CDS-2500A is a high energy degausser capable of erasing the newest metal tape formats of up to 2400 Oersted. The MDS-5 is recommended for data centers, schools, libraries, law enforcement offices, government agencies and corporate media centers. It will effectively erase tapes, cassettes, diskettes, cartridges and reels including: DLT, VHS, U-Matic, S-VHS, 3480's, 3490's, 8mm, DAT, Betacam SP, DVC Pro, MII, D1, D2, D3, D5 and many other formats.